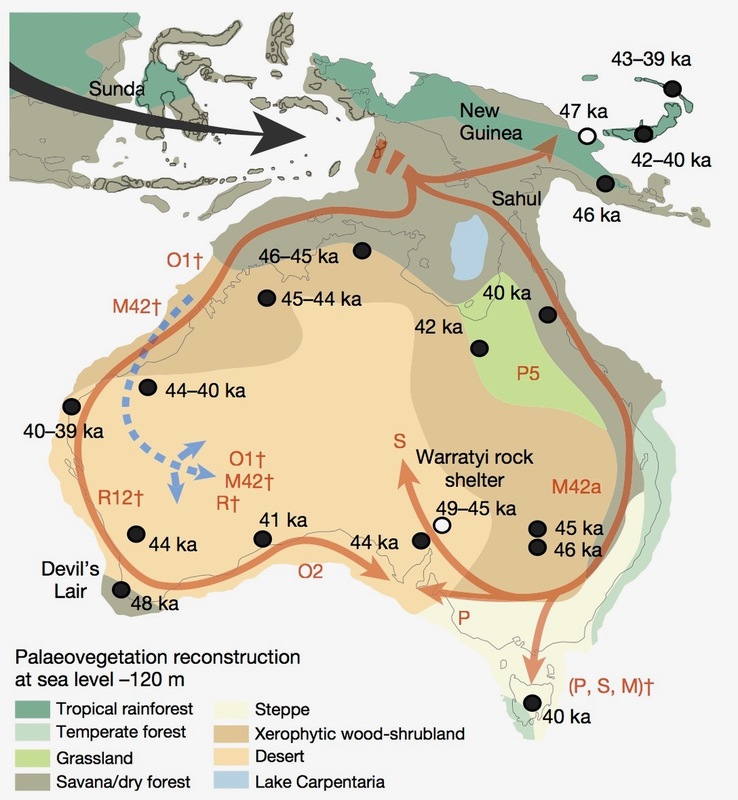 Exciting results published on Thursday in the international science journal Nature provide precious new insights into the arrival and movement of humans across Australia over a staggering 50,000 years. Sadly, many Aboriginal Australians no longer live where their ancestors had called home. So to better understand Australia’s history before the arrival of Europeans, a forward-thinking initiative called the Aboriginal Heritage Project was set up. Led by the University of Adelaide’s Australian Centre for Ancient DNA (ACAD), the team including researchers Professor Chris Turney and Dr Alan Williams from UNSW’s PANGEA Research Centre, in partnership with the South Australian Museum and Aboriginal families and communities, have uncovered some remarkable new findings. Headed by Alan Cooper and Ray Tobler, the group analysed over 100 hair samples collected with consent from Aboriginal people across the continent between the 1920s and 1970s. These samples were collected as part of a project where along with hair, detailed records of the individual, their family and culural heritage were documented by University of Adelaide researchers. The hair samples are truly precious, preserving mitochondrial DNA that is inherited through the mother back to the very founding Aboriginal population of Australia. The wonderful thing is the samples allow us to reconstruct a map of Aboriginal Australia before the arrival of Europeans. Crucially, over tens of thousands of years, the genetic code accumulates mutations at a fairly steady rate. This ‘molecular clock’ allows us to date the timing of arrival and migration across the continent. The genetic data revesals a story consistent with published archaeological evidence for human arrival some 50,000 years but give new insights into how the continent was settled over an almost unimaginable length of time. The peopling of Australia. Genetic groups given by letters. Ages shown as thousands of years ago (ka). Source: Tobler et al., Nature. The new results seem to show that the early population rapidly moved around the eastern and western fringes of Australia. Within just a couple of thousand years they had moved quickly enough to meet on the other side of the country somewhere near the Eyre Peninsula, South Australia. But the headline result is that in spite of all the climate and environmental extremes that followed, communities don’t appear to have moved much after this. Genetic differences are found in groups from specific geographic regions and don’t seem to have mixed much at all. Not when the mega-arid ice age occurred 20,000 years ago. Or when sea levels rose dramatically 14,000 years ago. Instead of mass migration, the data suggests communities may have only moved within the immediate region. The basic pattern of effectively held for 50,000 years. No wonder Aborigine communities speak so movingly of their links to country. A central pillar of the Aboriginal Heritage Project is that Aboriginal families and communities have been closely involved with the project from its inception and that analyses are only conducted with their consent. Importantly, results are first discussed with the families to get Aboriginal perspectives before scientific publication. The research model was developed under the guidance of Aboriginal elders, the Genographic Project, and professional ethicists. This is the first phase of a decade-long project that will allow people with Aboriginal heritage to trace their regional ancestry and reconstruct family genealogical history, and will also assist with the repatriation of Aboriginal artefacts.